Lodge at Spruce Peak - 3 Bdrm, Ski In/Out & Steps Away from All the Action! When you vacation at Steps Away, just worry about getting to the at Lodge at Spruce Peak and our team will take care of the rest! The pampering starts as soon as you pull up to the five-star lodge, with everything you need just “Steps Away”. The friendly bellmen greet you at your car, taking your equipment to the ski valet and your luggage to the condo. Each morning you’re greeted with gorgeous views of Mount Mansfield and glimpses of Smugglers Notch. After you fuel up with breakfast in our fully-equipped gourmet kitchen, head down to the ski valet where you’re just steps from the Over Easy gondola and Spruce Peak chairlifts. Don’t feel like cooking? Call up the 24-hour room service or visit one of the many on-site dining venues. Steps Away offers plenty of room for everyone to get a good's nights sleep with three bedrooms and three full bathrooms. The first bedroom has a king bed and full bath with separate tub and shower, the second bedroom offers a king bed and full bath with shower, and the third bedroom features two queens and full bath with separate tub and shower. If the kids (or you!) need a little break from the hustle and bustle of the base lodge, sneak back to the nearby condo for some rest time before getting back on the mountain for more skiing and snowboarding. The Stowe area also offers other snow-related activities like ice skating, snowshoeing, sleigh rides, dog sledding, and snowmobiling. When you're not on the slopes, thaw out and have some fun in the heated outdoor pool and hot tub. Non-skiers have plenty to do too. They can take in the high-end retail stores, get pampered at the world-class spa, or visit the fitness center for a yoga class. Just down Mountain Road there are even more terrific shopping and luncheon venues. For an additional fee, you'll have access to the Stowe Mountain Club during your stay. The membership includes entrance to the clubhouse, golf cottage and members-only areas around the base lodges, unlimited access to the fitness center and classes, complimentary buffet breakfast in the winter and discounted golf in the summer. When it's time to come in for the day, snuggle up in front of the fireplace and our huge 55” television in the living room to host your own movie night. Rather go out for the night? Leave the little ones in good hands with "kids night out" where they'll have their own fun while you head out to the Pub or have a romantic dinner at Solstice. The fun at Steps Away doesn’t stop when the snow melts. The summer months are a wonderful time to enjoy sailing on nearby Lake Champlain, or remaining on resort where you'll find golf, hiking, zip-lining, a treetop obstacle course and rock-climbing wall. There's even a farmers' market on-site! Throughout the year, enjoy local bands and interesting musicians at the outdoor Pavilion or see popular entertainers at the Spruce Peak Arts Center. Both venues are a 4-5 minute walk from our unit. Other Stowe-area activities include terrific Mountain Road restaurants, cycling, movies, mini-golf, bowling and fly fishing. No matter what time of the year you visit, Steps Away is sure to delight and relax you, with incredible amenities just steps from your doorstep! Before purchasing Steps Away at Lodge at Spruce Peak (formerly Stowe Mountain Lodge), our crew was a big Sunday River family. However, once we experienced the easy drive and terrific après ski scene in Stowe we were hooked. So many wonderful activities to do when you're not on the slopes - hiking, snow shoeing, restaurants, shopping, concerts, bowling, movies, ... The Stowe area has it all! Come summer time, we enjoy golf, ziplining, obstacle course, tennis, on-premise concerts on the village green and at the Spruce Peak Arts Center, scenic drives and time in Burlington. Sailing on Lake Champlain is not to be missed. As well as being "steps away" from all Stowe activities, our unit stands out for its: - Beautiful view of Mt. Mansfield and a portion of Smugglers Notch - Quiet location away from stairs, elevators, building equipment and pool noise - Upgraded amenities like our 55" living room television (for movie night), chef-outfitted kitchen and full-sized washer & dryer. Luxurious spacious bathrooms with marble treatments and floors. Located at Stowe Resort, on Spruce Peak, in the fabulous Stowe Mountain Lodge. Overlooks Mt Mansfield and Smugglers Notch. $10 access to spa, locker rooms, fitness center and classes when reserved in advance. Dining room table for 6, plus breakfast nook seating for 3 (bar stools). Full lineup of channels, including HBO. The Lodge has an arcade. Lawn games are available on the Village Green. Boccie court behind the Lodge. Many local bicycle shops are located right on the Stowe Bike Path. Ski in, ski out at Mt Mansfield or Spruce Peak. We're members of the Club at Spruce Peak, so we can get you discounted greens fees. Outstanding spa - a la carte pricing for services. $10/visit to the fitness center when booked in advance. A la carte, make use of Stowe Mountain Lodge's world class spa! All of the conveniences of home are provided including large living room TV. Pay-per-view is also available to see the latest movies. Downstairs kids can enjoy the game room equipped with the latest arcade games, go for a swim or participate in one of the many day or evening kids programs. New winter ice rink with nightly skating. New summer zip line tours, treetop obstacle course and indoor rock-climbing wall. Be sure to check-out a show on the village green or at the Spruce Peak Arts Center! They are adjacent to Stowe Mountain Lodge, and of course are 'steps away'. We had a wonderful stay at Stowe this weekend. The condo was spacious and perfectly located- our kids loved watching the gondolas go up and down the mountain. Our hosts were so kind, and very flexible- accommodating the needs of our young family. They responded immediately to any questions and requests. I cannot recommend staying here enough. You are in for a treat! Best place to stay at Stowe hands down. Quick walk to the slopes, and the restaurant in the lobby is fantastic. There is no better place to ski with kids than Spruce Peak, and Steps Away makes it even easier. The resort itself is extremely well run and everyone is very friendly and always helpful. The ski valet is a game changer for those parents who are tired of carrying all the gear back and forth. Steps Away is a spotless 3 bedroom piece of heaven...you know the kind of place you don’t want to review because you want to keep the secret to yourself! We were 2 families traveling with 4 kids and there was plenty of room to spread out and relax. From the Kerig coffee in the morning, to the full size washer and dryer, and ample wine glasses in the evening, this makes skiing with kids easy & relaxing. Ray, the owner is wonderful to work with and always an email away with prompt replies. We will definitely come back. Just a great stay at Steps Away! Jera, thank you for sharing your experience at our vacation rental and the Lodge at Spruce Peak... and for pointing out some of the differences between a hotel stay and one at Steps Away. We look forward to facilitating more fond memories next time you visit! Beautiful room and facility with polite and helpful staff. Room well equipped with some little things I had forgotten to bring. Just great all around. It's great to hear that you and your crew had a nice time. We look forward to your next stay! We have stayed at the property multiple times, it never fails to deliver, the property is spotless and we will defiantly return, the owner is great to deal with also. I would 100% recommend this property. It's good to hear your winter stay was as memorable as the one last summer! Everyone from our team, to the Lodge at Spruce Peak staff, to our housekeepers, is focused on creating the most amazing experience possible for you and your loved ones. Thank you for sharing your thoughts on Steps Away! We travel to Stowe each winter and love the place, so we decided to take a look during the summer months, no doubt we will return each winter and summer from now on, there's tons to do especially for families, our 5 year old did not want to leave. If you play golf the Mountain Course at Stowe Mountain Lodge is breathtaking, there was plenty of room at the pool each day and the staff at the hotel were great. The condo we rented was fantastic, very spacious and spotless clean, the owner was fantastic to work with and 100% truthful with his rental, the best part with this unit is that it can be configured to suit different size groups (make sure you rent the space with the kitchen and large living space which leads onto the balcony looking up the mountain face). We found a lot of great restaurants in the town of Stowe and all family friendly. We have already reserved the space for our winter vacation and will continue to return to Stowe and The Lodge, look no further, rent this unit today, you will not regret it. Ray, it was a pleasure hosting you and your family. So glad everyone had a good time... and thank you for the kind words about Steps Away! We take a lot of pride in exceeding guest expectations with upgrades like the gourmet kitchen, giant living room television, bath products, quiet location, access to the Club at Spruce Peak (formerly Stowe Mountain Club) and soothing view of Mt. Mansfield and the Over Easy gondola. We're looking forward to your next stay this winter! 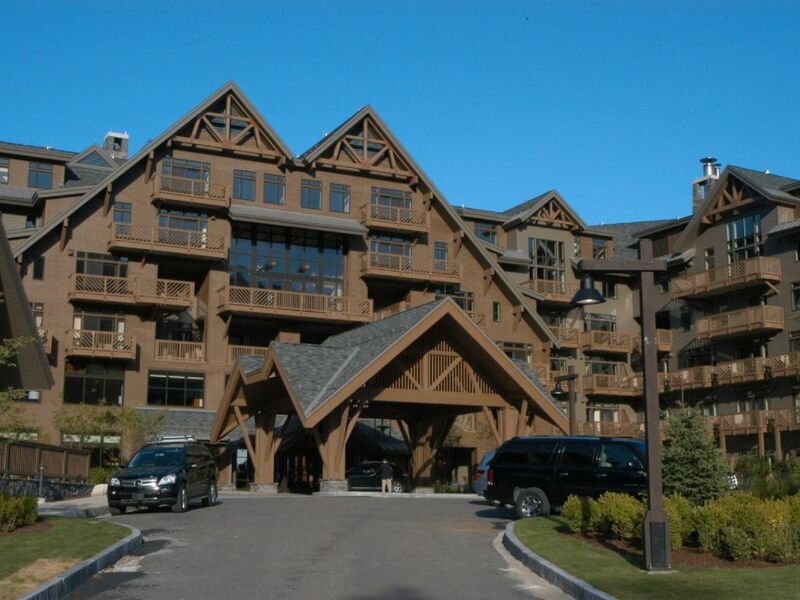 Enjoy resort living and the best Stowe Mountain has to offer. Challenging mountain golf. Experience the exceptional spa or professional fitness center. Shop the on-premises retail stores. Enjoy fine dining and nightlife. Hike Smuggler's Notch or go fly fishing. Nearby horseback riding or just relax and enjoy the majestic mountain view from your balcony. Steps away from the Spruce Peak lifts or take the Over Easy gondola to Mt. Mansfield. Other Activities: Zip lines and treetop obstacle course. Golf: Special access to Stowe Mountain Club's on-premises course. Ski: Stowe Mountain and Spruce Peak are known by many names... Aspen of the East, Best of the East or even Squaw Valley East. Come and take advantage of the outstanding slopes and half pipes, the high speed quads, or relax in the new base lodge. No pets or smoking. Renters get to park their first car for free - saving $23/night in parking charges. Repeat guests get free Exit Cleaning. Owners are members of the Club at Spruce Peak which means tenants get $15 access to the spa, fitness center and workout classes, along with discounted golf when arranged in advance. No Saturday check-ins or check outs during winter - they breakup popular weekend rentals.